“Hell is my natural habitat.” Not too many actors could pull off a sustained drunken performance throughout the entire length of a film. Albert Finney does just that as “Geoffrey Firmin,” an alcoholic, self-destructive former British consul in the small Mexican town of Quauhnahuac (Cuernavaca) on the Day of the Dead, November 1, 1938. 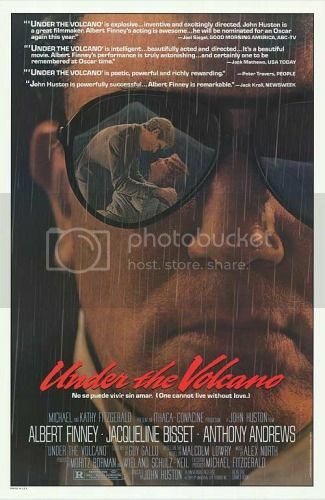 Based on Malcolm Lowry’s supposedly “unfilmable” semiautobiographical 1947 novel of the same name, Under the Volcano was directed by the legendary John Huston (who directed two other films in Mexico: The Treasure of the Sierra Madre in 1948 and The Night of the Iguana in 1964). The cast includes Jacqueline Bissett as Geoffrey’s long-suffering ex-wife “Yvonne Firmin” and Anthony Andrews as his idealistic half-brother “Hugh Firmin.” In his four-star review of the film, critic Roger Ebert remarked that Finney “gives the best drunk performance I’ve ever seen in a film.” I suggest that you read Lowry’s novel first so you can fully appreciate the film. The novel is full of some great lines such as "Where are the children I might have wanted? You may suppose I might have wanted them. Drowned. To the accompaniment of the rattling of a thousand douche bags." Under the Volcano would make a good double feature with the 1976 documentary Volcano: An Inquiry Into the Life and Death of Malcolm Lowry, which features selections of Lowry’s novel read by Richard Burton (who was actually Huston’s first choice to portray “Geoffrey Firmin”). Huston only directed two more movies – Prizzi’s Honor (1985) and The Dead (1987)—after Under the Volcano before passing away at the age of 81 in 1987. If you are seeking another overlooked gem starring Finney, check out Orphans (1987), which costarred Matthew Modine and Kevin Anderson. Useless Trivia: Finney was nominated for a “Best Actor” Oscar but lost out to F. Murray Abraham (Amadeus). Liked the movie, loved the book. Huston did an admirable job with the material and Finney is absolutely brilliant! As Lowry writes, "What beauty can compare to that of a cantina in the early morning?" That's for damn sure!